My update for April was very brief. I was trying to complete it minutes before the month of May ended, so I was under a bit of a crunch. It made me realize that it is much better for me to do these updates as early in the month as possible. If I work on the Genius Project updates later in the month, I am already under the influence of the current month and can’t really examine my previous month’s efforts objectively. 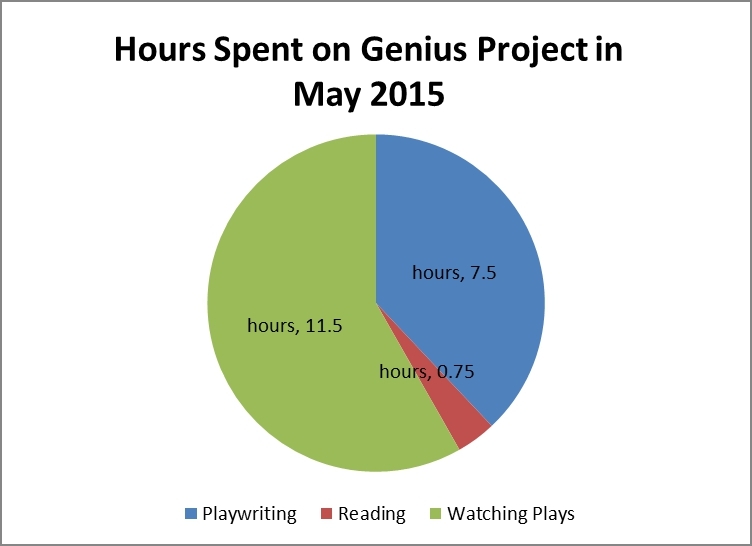 May is the first month that I did not manage to put in the minimum amount of hours for the Genius Project. Instead of doing 30 hours, I only put in 19.75 hours. Although I can come up with excuses, the main point is that even with those excuses, I still should have been able to put in the minimum of 30 hours. I will do better for the month of June. The breakdown of activities also demonstrates that it wasn’t a great month for my effort. More than half of the time spent on the project was watching plays. Play watching is a very important activity, don’t get me wrong; but I should be striving to be spending the bulk of my time writing. Ideally, I’d like to see myself spending at least 50% of my time writing and splitting remaining time between reading and watching plays. For next month’s update, I will use percentages in the chart, instead of the actual hours. And I can talk about the number of hours in the body of the update. I think it will help me keep focused on this tweaking of the ratios I’m shooting for. One of the plays I saw in May was Hamlet at The Stratford Festival. Man, that Bill Shakespeare can turn a phrase! I enjoyed the production and kept thinking that I should reread this play. It has been many years since I last read it. In fact, I should probably reread a bunch of his plays. If you’re going to learn from other playwrights, you may as well start with the best! I’m looking forward to my progress for the rest of June because I’ll be starting a new routine that will be more conducive to my preferred morning writing. I will also try to be more vigilant about sticking to at least a daily minimum. No TV – gasp! – until that minimum is met. Total hours spent on the Genius Project so far are 739. That means I only have 9,261 hours before I get to 10,000. Each hour spent is an hour closer to the goal.